Paracetamol, also known as acetaminophen, is safe to be used by infants and children at the right doses and can help to relieve pain and reduce fever. It is thought to work by changing the messengers of pain in the central nervous system, called prostaglandins. As a parent, it can be distressing to see your child in pain, and finding a way to help to make them feel better as their body heals is important. 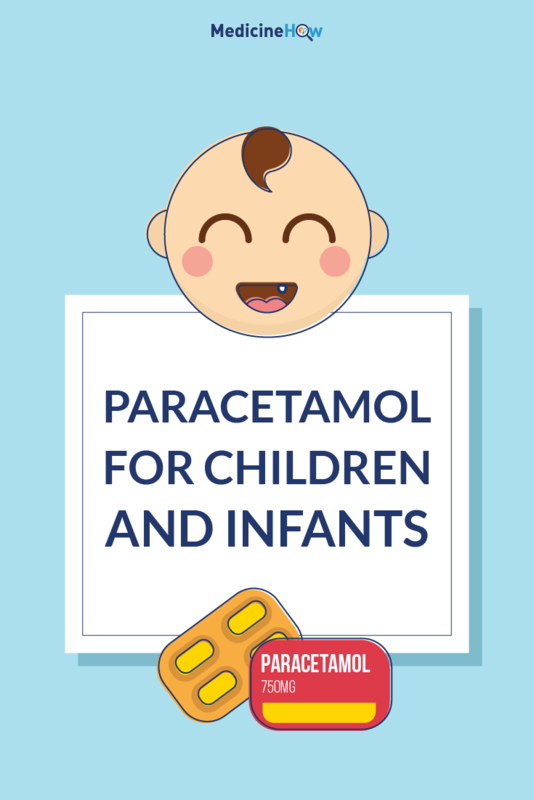 Being aware of the different options available and how to use paracetamol for children and infants in the best way is essential when looking after your child at home. Paracetamol can be used to relieve pain and reduce fever in children. There are many different types of pain that it might be used for, such as a toothache, earache, stomach ache or infection. Very young children and infants may not be able to communicate what part of their body is feeling pain. In fact, often the only way you are able to tell that they are in pain is by observing by the way they act. For example, young children and infants who are in pain are often irritable and have difficulty settling or sleeping. As paracetamol has a general effect to relieve the pain of on the whole body, it is very useful help children feel better when they are in pain but can’t describe what is wrong. Additionally, paracetamol also helps to reduce fever and is often used to regulate body temperature for children who have a high temperature due to an infection or other illness. A low fever (38-38.5°C or 100-101°F) can usually be tolerated by children and making sure your child is comfortable and stays hydrated may be all that is needed. For higher temperatures (more than 38.5°C or 101°F) paracetamol is usually recommended to help keep the fever down. Read more about pain relief for children and infants. We are not completely certain about how paracetamol works, but we know that it has a general effect on the whole body. It probably affects the central nervous system by changing the “messages of pain” that your brain gets. Paracetamol is thought to block the production of the central prostaglandins, which usually act as messengers telling the brain when the body is pain or danger. If it blocks the prostaglandins that carry the pain signals, relief of the pain can occur. It also reduces fever due to its effect on the prostaglandins. Click here for more detailed information about how paracetamol works. 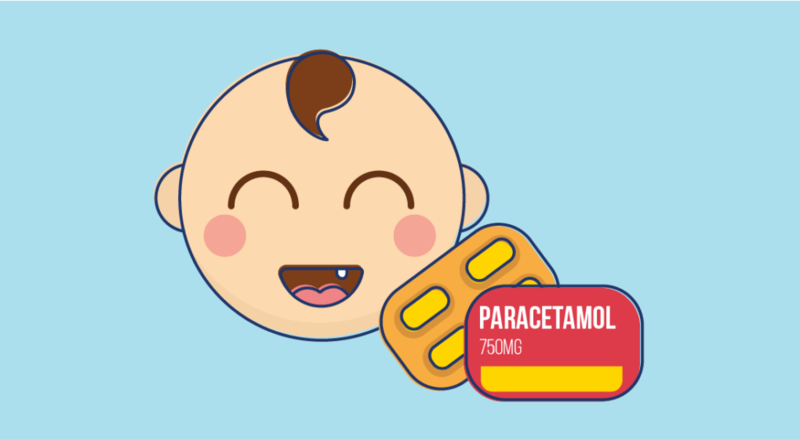 Paracetamol for children is not associated with many side effects and most children can take paracetamol to relieve pain or reduce fever without experiencing significant side effects. Rarely, side effects such as a rash, allergic reaction, drug fever, low levels of cells in the blood, or inflammation of the liver may occur. However, the most worrying side effect is hepatotoxicity, or toxicity of the liver. This usually only happens when the dose is too high, particularly if you give your child paracetamol for several days in a row. For this reason, it is important that you make sure that the dose of paracetamol that you are giving your child is correct. Paracetamol is the generic names (the actual drug inside the medication) but you might have a brand name that is called something different. Whichever brand you using, they all contain the same drug and do the same thing – they just have a different name depending on which company manufactures the medication. The right dose of paracetamol for your child will depend on the weight of your child. Weight is more important than age because growth and body size can be very different between children who are the same age. The recommended dose for children is 15 mg/kg every 4-6 hours. Slightly higher doses, such as 20-30 mg/kg can be given at a single time, for example to help your child sleep at night, but the standard dose should be less. Keep in mind mg are not mL of the medication. The formulations of paracetamol usually contain 24 mg or 48 mg in each mL of the medication. Don’t worry too much about the math. In most cases, there should be a handy table on your medication that has already worked it out for you. Just look up your child’s weight and it should show you how much medication to take. There are two main formulations of paracetamol for children: an oral elixir and suppositories. Both of these are recommended for children because they do not have to swallow a tablet, which is the standard formulation of paracetamol for adults. There are two strengths of the elixir available: 24 mg/mL and 48 mg/mL. The dose given depends on the weight of the child. There are three strengths of suppositories available: 125 mg for children <5 years, 250 mg for children <12 years, and 500 mg for children and adults over 12 years. The oral elixir is usually preferred over the suppositories because it is easier to use and we have a better idea of how it will affect the child so getting the right dose is simpler.